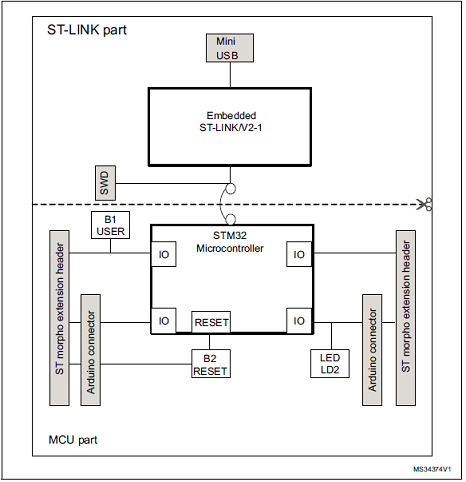 ST公司的STM32F401xD/xE系列是基于高性能ARM® Cortex® -M4 32位RISC核,工作频率高达84MHz,具有浮点单元(FPU)单精度,支持所有ARM单精度数据处理指令和数据类型,还能实现全套DSP指令和存储器保护单元(MPU),从而增强应用安全性.器件具有高速嵌入存储器(512KB闪存,96KB SRAM)和扩展的增强I/O和外设,连接到两条APB总线,两条AHB总线和32位多个AHB总线矩阵;此外所有器件提供一个12位ADC,一个低功耗RTC,六个通用16位计时器,以及多种标准和高档通信接口如I2C,SPI和全双工I2S,以及USART,SDIO接口和USB 2.0 OTG全速接口等.工作温度�C40到+105℃,工作电压1.7V-3.6V.器件主要用在马达驱动和应用控制,医疗设备,工业应用如PLC,逆变器和电路中断器,打印机和扫描仪,告警系统,视频连接和HVAC,家用音频设备以及其手机传感器集线器.本文介绍了STM32F401xD/xE系列主要特性,框图,电源方案图以及评估板STM32 Nucleo-64板主要特性,硬件框图,电路图,材料清单和PCB布局图. The STM32F401XD/XE devices are based on the high-performance ARM® Cortex® -M4 32- bit RISC core operating at a frequency of up to 84 MHz. 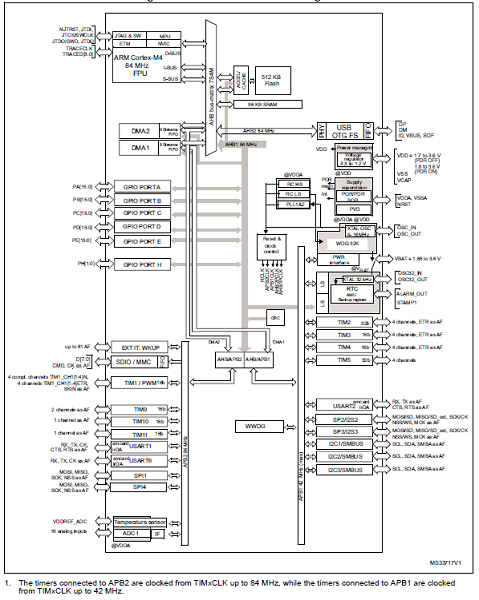 Its Cortex®-M4 core features a Floating point unit (FPU) single precision which supports all ARM single-precision data-processing instructions and data types. It also implements a full set of DSP instructions and a memory protection unit (MPU) which enhances application security. 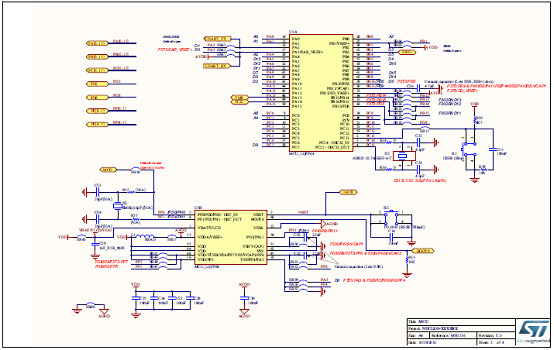 The STM32F401xD/xE incorporate high-speed embedded memories (512 Kbytes of Flash memory, 96 Kbytes of SRAM), and an extensive range of enhanced I/Os and peripherals connected to two APB buses, two AHB buses and a 32-bit multi-AHB bus matrix. 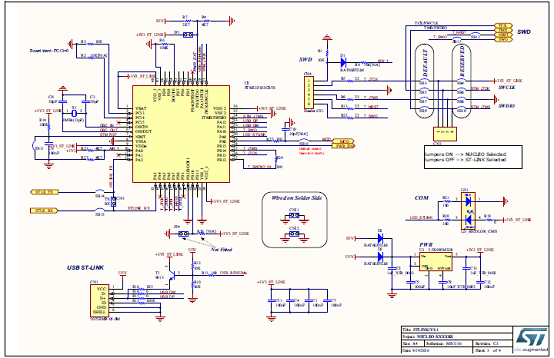 All devices offer one 12-bit ADC, a low-power RTC, six general-purpose 16-bit timers including one PWM timer for motor control, two general-purpose 32-bit timers. They also feature standard and advanced communication interfaces. Refer to for the peripherals available for each part number. 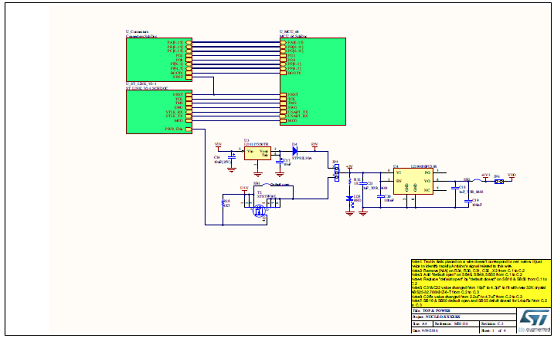 The STM32F401xD/xEoperate in the �C40 to +105 ℃ temperature range from a 1.7 (PDR OFF) to 3.6 V power supply. 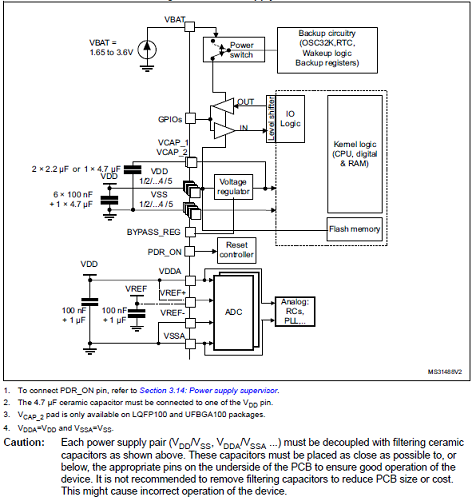 A comprehensive set of power-saving mode allows the design of low-power applications. 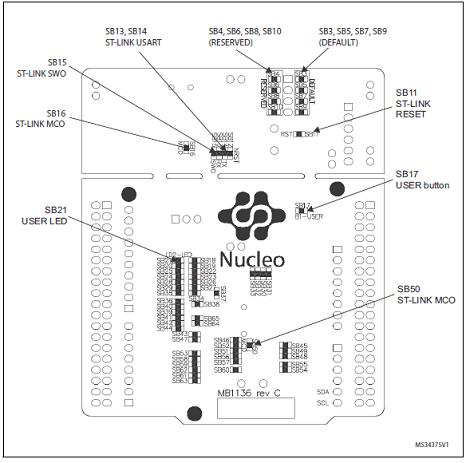 The STM32 Nucleo-64 boards (NUCLEO-F030R8, NUCLEO-F070RB, NUCLEO-F072RB, NUCLEO-F091RC, NUCLEO-F103RB, NUCLEO-F302R8, NUCLEO-F303RE, NUCLEO-F334R8, NUCLEO-F401RE, NUCLEO-F410RB, NUCLEO-F411RE, NUCLEO-F446RE, NUCLEO-L010RB, NUCLEO-L053R8, NUCLEO-L073RZ, NUCLEO-L152RE, NUCLEO-L452RE, NUCLEO-L476RG) provide an affordable and flexible way for users to try out new concepts and build prototypes with the STM32 microcontrollers in LQFP64 package, choosing from the various combinations of performance, power consumption and features. 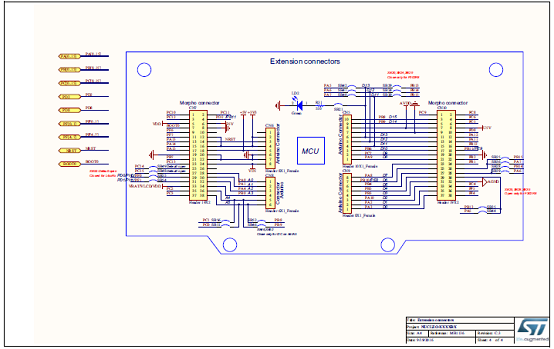 The Arduino™ Uno V3 connectivity support and the ST morpho headers allow to expand easily the functionality of the Nucleo open development platform with a wide choice of specialized shields. 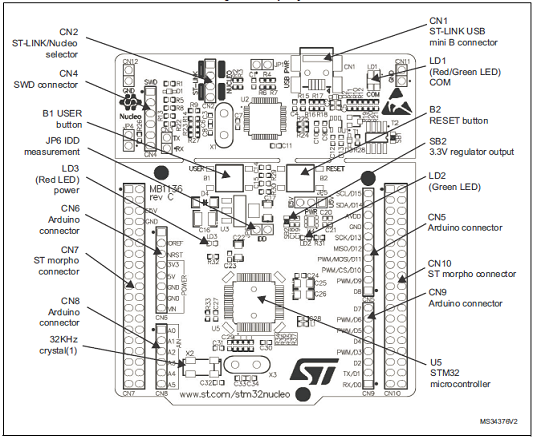 The STM32 Nucleoboards do not require any separate probe as they integrate the ST-LINK/V2-1 debugger and programmer. 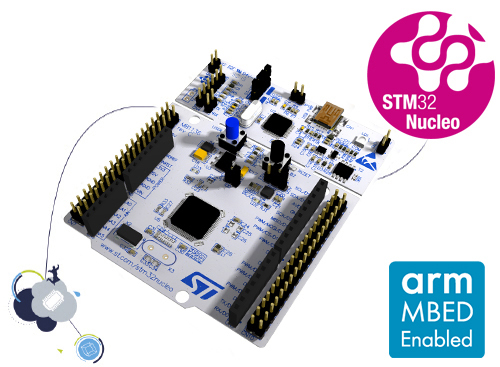 The STM32 Nucleo boards come with the STM32 comprehensive software HAL library together with various packaged software examples, as well as direct access to the Arm® Mbed™ online resources at http://mbed.org/.